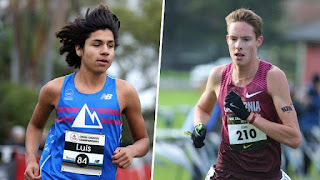 St. Joseph Notre Dame senior Cooper Teare and Armijo senior Luis Grijalva (photo courtesy of Travis Miller and MileSplit), two of the top cross country and track and field runners in the nation stepped away from the track to compete at the Davis Stampede Half Marathon yesterday (Sunday 2/12). Teare was the winner of the race with a time of 1:12:05.5 followed by Grijalva at 1:12:58.3. You can check out official results at this LINK. For those of you not familiar with half marathons, Teare's time breaks down to 5:30.19 per mile. Grijalva's time breaks down to 5:34.22 per mile. One other interesting note, the Crystal Springs course record holder Mitch Kingery ran a 2:23:47 marathon as a sophomore which is 5:29.27 per mile. 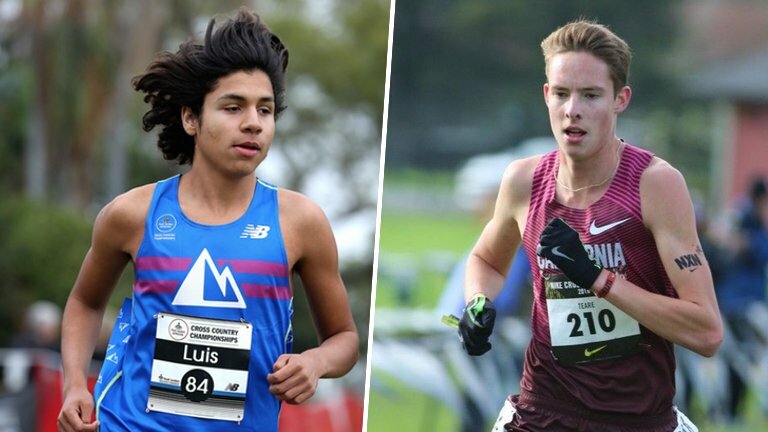 I am fairly certain both Teare and Grijalva ran controlled races as they look ahead to the start of the outdoor track and field season. Pretty crazy, but nice to see young men of that caliber who like to compete. I would be willing to bet that, since this was in Davis, that it was the idea of Michael Vernau. It seems he is working through a niggling injury and trying to get it straight prior to track season getting going.